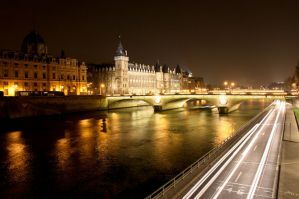 Paris, France’s capital, is a major European city and a global center for art, fashion, gastronomy, and culture. Paris’ monument-lined boulevards, museums, classical bistros and boutiques are enhanced by a new wave of multimedia galleries, creative wine bars, design shops and tech start-ups. The sky scraping, wrought-iron Eiffel Tower, broad Arc de Triomphe guarding the glamorous avenue des Champs-Elysees, gargoyled Notre Dame cathedral, lamplit bridges spanning the Seine and art nouveau cafes’ wicker-chair-lined terraces are classic Parisian emblems. However, despite initial appearances, Paris&apos; cityscape isn&apos;t static: there are some stunning modern and contemporary icons, too, from the inside-out, industrial-style Centre Pompidou to the mur vegetal (vertical garden) gracing the Musee du Quai Branly, the glass sails of the Fondation Louis Vuitton contemporary-art center, and the gleaming steel egg-shaped concert venue La Seine Musicale. The city is also known for its cafe culture and designer boutiques along the Rue du Faubourg Saint-Honore. France&apos;s reputation for its cuisine is known world-wide, and whether you seek a cozy neighborhood bistro or a triple-Michelin-starred treat, you’ll find that every establishment prides itself on exquisite preparation and presentation of quality products. 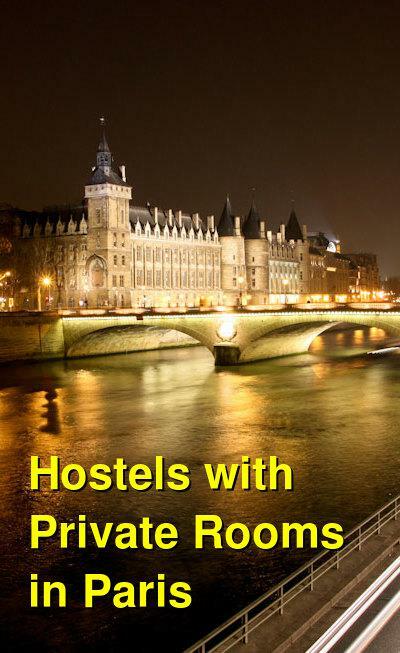 Paris is a lively and exciting destination and these hostels that offer private room options provide an excellent base for exploring the area. FIAP Jean Monet is located 20 minutes from the Latin Quarter, Le Louvre, and the Eiffel Tower. The hostel has 480 beds in single, twin, triple and quads rooms, all equipped with ensuite shower and toilet. Breakfast is included and towels and linen are provided. The hostel has a very nice atmosphere in a quiet area close to a metro station. The onsite cafeteria caters for lunch and evening meals. Guests under 18 are only allowed with an adult. Dormitories only available for guests between 18-30 years. The property has an elevator and is wheelchair friendly and free Wi-Fi is available. There is a common room and outdoor terrace available where guests can relax and get to know fellow travelers. DVD&apos;s, board games, and a foosball table are available as well. Les Piaules is located in a fully renovated art deco building. Les Piaules offers a rooftop terrace with a fantastic view on Paris&apos;s iconic monuments, fast free Wi-Fi, check-out until 12am, custom bunk beds (with curtains, reading light, power plugs, private lockers, and comfy mattress), a stylish bar with a carefully curated selection of local beer, coffee, French specialties, 24/7 check-in, a multilingual staff, local food and drinks, city expert desk, and breakfast at a small fee. Les Piaules is located in the artsy district of Belleville which features a bunch of bars and coffee shops full of young and cool people, and close to all must-see attractions in Paris (50 meters from Belleville metro hub). The property is less than 10 minutes from Paris&apos;s historical center where you&apos;ll find Le Marais, Chatelet, Republique, Notre-Dame, and Saint Germain des Pres, and has a Direct access to all historical places (Champs Elysees, Moulin Rouge, Pere Lachaise, and more). Minors are only accepted in private rooms with an adult. Linens are free with your stay and towels are available for hire. St. Christopher&apos;s Inn is just 2 minutes from Gare du Nord train station, and offers fast free Wi-Fi and modern beds with privacy curtains. Also a continental style buffet breakfast is available every morning for a small additional fee. The property is also home to Paris&apos; biggest international bar Belushi&apos;s, where you&apos;ll meet travelers and locals alike and receive 25% off food and 2 for 1 drink specials. Every room at St Christopher&apos;s Paris Gare du Nord includes heating, electronic key security, secure locker storage, private or shared bathrooms, and elevator access. The modern hostel &apos;POD&apos; beds have curtains for extra privacy as well as comfort and are fitted with power plugs, USB chargers, and reading lights to help you rest and relax during your stay. Other awesome facilities and services offered at our Paris Gare du Nord hostel include: clean bed linen provided and your bed freshly made before arrival, a travel kiosk with discounts on trips in and around Paris, a self-service laundry facility, a common room and internet lounge, a friendly and multilingual reception staff, and free city walking tour and Paris introduction. The 3 Ducks is only a 15 minute walk to the Eiffel Tower. 3 Ducks is housed in a former 18th century coaching inn considered to be a historical monument and is protected by Les Batiments de France as such. Founded in 1987, the 3 ducks is the oldest private hostel in France. These almost 30 years serving millions of travelers around the world have earned the 3 ducks its international reputation for its lively and friendly atmosphere. The entire building has been recently renovated and restored with a renowned French architect and two graphic artists, the result is spectacular. Today the 3 ducks offers all amenities a traveler could expect including rooms with shower and toilet, hairdryer, Wi-Fi, safe, reading lamp with USB ports, and air conditioning, all in a uniquely decorated environment. With its magnificent outside terrace and exclusive services, the 3 ducks hostel is one of the most comfortable and well-designed hostels in Paris. Guests must be 16 or older. Breakfast and linens are free with your stay and towels are available for hire.